When it comes to assessing the quality of your roof, it can be challenging to know exactly what to look for. This may be especially challenging if you haven’t been the victim of a hail storm or severe weather event. The life expectancy of a roof is 20-30 years, but that number seems to come from a perfect world. One where elements like weather don’t affect us on a daily basis! The deck is the wooden, structural surface of the roof. The drip edge is a non-corrosive material placed at the edge of the roof to channel runoff water. The underlayment acts as a barrier between the deck and the shingles, and works to keep the deck dry. The soffit is the underside of the roof overhang. Soffit is not always replaced when someone gets a “new roof”. The fascia is what holds the gutters in place. It also prevents moisture from damaging the roof. The vents allow air to escape and keep your roof dry. 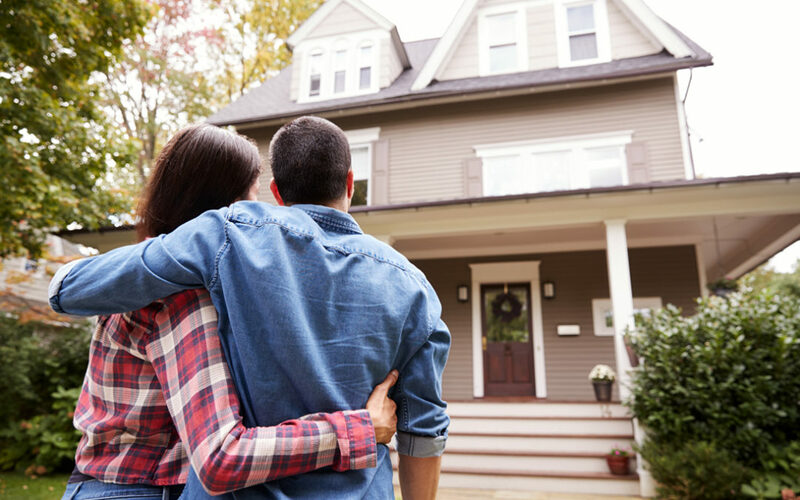 With all these terms, it’s easy to see how a homeowner can get overwhelmed at the idea of considering a roof replacement. However, now that you have a bit of understanding of the lingo, it’s time to assess. 1. Are my shingles curled or damaged? 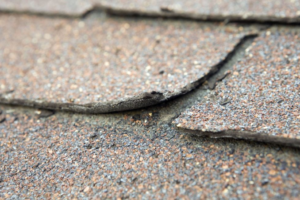 If your shingles are curled or cracked, there’s a good chance they’ve been damaged. They’re no longer effective at doing their job, which is repelling water from your home. For asphalt shingles specifically, it’s a telltale sign as the corners begin to curl downward or upward as they age. Other things to look for with shingles are bald spots (missing shingles) or finding shingle granules in your gutters (which means your shingles are breaking down). While you can spot bald spots or badly curling shingles from the ground, you may have to get on the roof to inspect a bit more closely for cracks or shingles that are in the beginning stages of decline. 2. Is my home more than 20 years old? If your roof is more than 2 decades old, there’s a good chance it’s near the end. In fact, many insurance companies are making it harder to insure roofs that are more than 20 years old. In a state like Nebraska, wind and hail can destroy a roof twice as fast compared to average. That means if your roof expectancy was upwards of 30 years, it’s now somewhere around 20 years. Why is 20 years the magic number? Shingles are built with a layer of asphalt and fiberglass as the most basic part of the shingles. Colored granules are then used as the top part of the shingle. These granules protect the asphalt from the sun. With a loss of granules, the asphalt is exposed to the sun which accelerates the aging process. Granular loss can be caused by hail as well as other extreme weather conditions. As shingles age, specifically around 12-15 years, they become stiff and brittle. This also which makes them more susceptible to wind, rain, ice, and hail. Around 12-15 years is also when the granular coating slowly starts to lose its hold. In other words, it’s time to get a roof inspection and let us take a closer look! 3. Were there icicles on the edge of your roof this past winter? Icicles are pretty, but not pretty on your roof! This is a sure sign of “ice damning” – a large buildup of ice that forms along the edge of a roof. Without proper care, ice dams can lead to serious damage to the roof itself, rain gutters, and downspouts, and the inside of a home. Ice dams form when the roof over the attic gets just warm enough to melt the underside layer of snow on the roof. The melted portion slowly trickles down between the still frozen layer of snow and the shingles, right up until it reaches the eave of the roof. Because the eave extends over the side of the house, it’s always much colder than the rest of the roof. This means that once the melted snow reaches that point, it refreezes. This cycle will repeat itself until an actual dam of ice is built up at the edge of the roof. Once an ice dam gets big enough, melted water begins to back up behind it – which can seap underneath shingles. If you did have ice damming or notice icicles on your home this winter, it’s time to get a professional in there to take a look. 4. Did your home encounter one or more hail storms last year? Even a hail storm that didn’t seem that impactful could be a source of damage for your home’s roof. Spotting hail damage on your belongings, such as your car or aluminum patio furniture is pretty straightforward. You’ll notice little dings where the hail fell and impacted the surface. 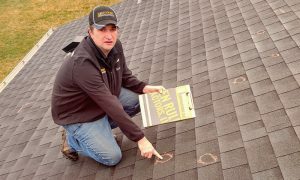 Spotting hail damage on your roof, however, isn’t as straightforward. The basic guideline here is to have a professional come look at your roof if you had any sort of hail storm in the last year (that lasted for more than a few short minutes) and haven’t had your roof inspected yet. 5. Is there sagging, signs of water damage, or streaks and stains on the inside of your attic? The roof is the protection barrier between your home and the world outside. If it gets damaged, one of the first places that can suffer the consequences is the attic. Daylight through the roof boards. If you can see daylight coming through the boards, water is coming through as well. Dark streaks or water stains. This is a sign that the roof is leaking moisture and not only is it damaging the roof, but it’s probably damaging the interior of your home as well. Sagging areas. If your roof is leaking, the water buildup can make your roof begin to sag. We’ve inspected thousands of roofs – if you have any questions about your roof, shoot us a note!